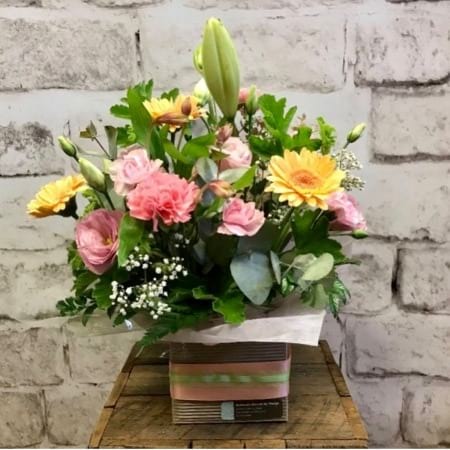 The gorgeous Spring Sensation is a delicate mix in lemon and pink flowers, the perfect flower arrangement for delivery for a new baby gift or mother’s day present. Featuring fresh seasonal flowers like classic lisianthus, bright gerberas, lilies and mixed seasonal blooms. A wonderful floral gift for any home, office or hospital room. A unique arrangement from Newcastle`s Amaranthine Flowers By Design. Your local family-owned florist in New Lambton, Newcastle.